Barnet Multi Faith Forum celebrated Silver Sunday with over 300 guests and community organisations and various dignitaries. The celebration got underway with an address from Mayor of Barnet, followed by the Director of Social Services followed by Bollywood Dancing, Tai Chi and exercise to music followed by light refreshments. Silver Sunday is an annual day of fun and free activities for older people across the UK. Led by The Sir Simon Milton Foundation, it celebrates the value and knowledge they contribute to our communities while combating loneliness and isolation. Everyone can get involved, whether that’s organising an event, spreading the word, or simply attending an activity. Silver Sunday is celebrated together with the International Day of Older Persons. As part of Silver Week, Greater London Leisure were offering taster sessions in different types of exercises and we are pleased to say that one Faith Group accepted the offer and are now going to have regular weekly sessions at their place of worship. The BMFF stall attracted a lot of attention from the participants; some were very keen to volunteer whereas others were interested in taking part in any activities hosted or supported by BMFF. 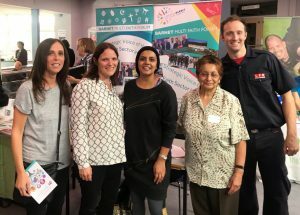 Councillors were also very keen to support BMFF work and we have some of them in our photographs – Councillor Sara Conway, Councillor Sachin Rajput and Councillor Anne Clarke. As part of joint working, we made contact with the Firemen (who had a stall near BMFF); they are very happy to promote safety in Faith Groups.